What if you could get the opinion of multiple experts from around the world without ever leaving the comfort of your home? The innovative concept known as Telemedicine is emering as a game changer for many health professional now being available to you. At the forefront of this technology for skin care is Tele-Dermatology the fastest growing subspecialty in the medical field of dermatology. In the field of medicine, Tele-Dermatology has become one of the most common application of telemedicine and e-health. 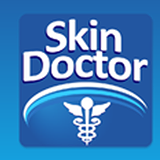 Your introduction to this forward technology is available to you with the safe secure mobile application know as " Skin Doctor" ! Your skin plays an important role in protecting your body...keep it as healthy as you can.